Pioneer Comics; Pioneer Comics (1988-1989). In total 19 volumes. Value around 5 USD each. Pioneer Montly;Pioneer Comics (1989). At least 8 volumes. These 48-page black and white comic books reprints Prince Valiant comic strips by John Cullen Murphy. Also included are Rip Kirby strips by Alex Raymond, Secret Agent by Archie Goodwin and Al Williamson, and Mandrake by Lee Falk and Phil Davis. The strips are not presented as originally reprinted... they are recut and resized to make the page layouts look more like a traditional comic book interior. Value USD 10. 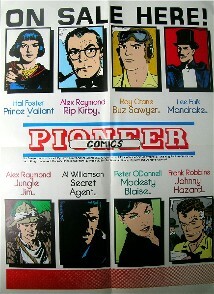 Pioneer Annual; Pioneer Comics (Winter 1988). The Official Prince Valiant Annual #1. I don't think there is more as one volume published. Value USD 10. Pioneer Giant size; Pioneer Comics.The Official Prince Valiant Giant size #1. I don't think there is more as one volume published. Value USD 10. Pioneer King size; Pioneer Comics.The Official Prince Valiant King size #1. I don't think there is more as one volume published. Value USD 10. Pioneer; official collection; Pioneer Comics.The Official Prince Valiant collection #1. Printed 1989. I don't think there is more as one volume published. Value USD 10.